I WISH I was an expert on this topic. I have read a fair amount about thyroid and adrenal problems because it’s something I deal with ongoing. Then there’s the whole progesterone/estrogen/testosterone balance, and the fact that these can get way out of whack when you get to a certain, more mature, age. Since I’m not an expert, I’m going to give you the links to what I believe are the best and most accurate resources (which often includes what is NOT mainstream information) for researching and addressing these issues, and which I have utilized for working on my own conditions with success. One thing I DO know. Hormone imbalances DO effect both weight loss and ability to maintain weight. I have experienced it first hand. I have had the confounding experience of eating and exercising a certain way which allowed me to maintain my weight effortlessly for several months, only to then suddenly, without ANY lifestyle change whatsoever, have my weight go up 5-7 in a matter of a few weeks – hydrostatic body fat testing showed it was indeed fat. I did get to the bottom of it – for me it was a low cortisol/adrenal fatigue issue, and when I started a physiologic dosing schedule of cortisol, the fat came back off over the next couple months and I even gained 2 lbs of muscle during that time as well. Again, my lifestyle this entire time was exactly the same – I eat the same foods from week to week and I always go to crossfit 3 days a week. That’s it. Doesn’t change. So I know this hormone stuff is big and is worth investigating. Actually in this day and age with our environment so polluted – what’s falling from the sky (google chemtrails and aluminum) what’s in our water (fluoride- we are drinking poison, and fluoride is a halogen that replaces iodine in our thyroid- not good), what’s in our food, (gmo’s) we can easily be dealing with major hormone imbalances at ANY age. If you look at the test results that your doctor used to tell you you’re not hypothyroid and that your thyroid levels are normal, I can bet you like 90% the test they ran was the TSH test – and what did Dr. Holtorf say about about the TSH? It’s telling a bunch of people they’re normal when they are actually hypothyroid. IF YOU HAVE LOW THYROID SYMPTOMS (hello, constant fatigue) – but whatever test your doctor ran said you weren’t hypothyroid – PLEASE LOOK AGAIN. Likely you did not have the proper testing to uncover if you’re truly hypothyroid, and this can really change your life getting properly medicated for this- both in quality of life due to major increased energy and ability to simply do things and live, as well as emotional and physical well-being by having your body respond to normal efforts of proper eating and exercise. I will keep updating this list. It’s all the current, cutting edge resources for information on these hormone topics. TIP! 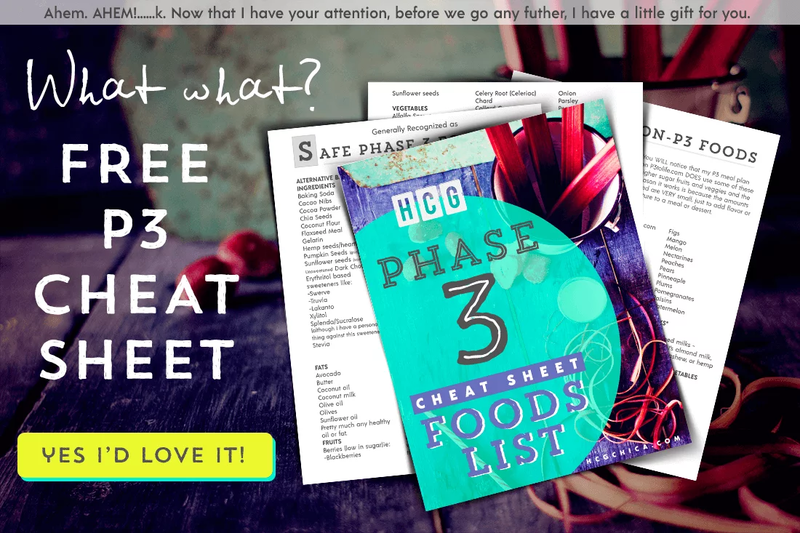 IF you are looking for something that has all the hCG info you need in one place, AND a place to daily/weekly track your progress, that’s printable and fillable on your device and reusable, you might want to check out my digital hCG workbook. Interpreting Your Lab Results (this is important because in the know people with health conditions have come to find that being in “the normal range” on the testing is not actually a reliable indicator at all). Order your own medication online like cortisol and t3/cytomel (you can get 10% discounts on every order through fastescrowrefills also if you used the coupon code hcgchica) – I purchase my own stuff whenever I can because I like being in control of my own health. It makes me so sad when I read things on forums that say stuff like, “I was feeling so great on my thyroid medication, but then I went to my doctor/endocrinologist who reduced my medication because he said my lab values were too high/etc. and now my hypothyroid symptoms are all back and I feel horrible but my doc/endocrinologist won’t raise it back up and now I’ve felt like the living dead again for 8 months.” This is just so messed up. Treating patients has to include dosing based on symptoms and symptom relief. This is YOUR life and it’s your only one – I do not believe anyone has the right to control your health and how bad or good you feel as a result. Doctors and the government did not give you life. God did. Can you imagine? Going for months and months feeling horrible simply because someone else will not raise your medication back to a level where you had felt great because of of a test? Don’t get me started I’ll get too mad. Anyway, this is the reason that when possible, it’s nice to have access to things online. I’m not saying you’ll never find a good doc or endocrinologist, and if you do they are worth their weight in gold, but they are definitely the minority not the majority and I don’t believe in simply wasting your life away being ill just because you can’t locate a good doc. Stopthethyroidmadness.com – this woman, Janie Bowthorpe, is fearless and because of this, her info is the best out there. She doesn’t let anyone scare her into hiding the real information we need. Stop the Thyroid Madness – Janie Bowthorpe (this one is a MUST have). Iodine – Why You Need It, Why You Can’t Live Without It – Dr. David Brownstein (this is EXCELLENT). Hypothyroidism – Type 2 – Mark Starr, M.D. Safe Uses of Cortisol – Dr. William Jeffries – very useful stuff for treating adrenal fatigue effectively. Bioidentical Hormones 101 – Jeffrey Dach, M.D. The Fast Metabolism Diet – Haylie Pomroy This book is a possible method to look into for Phase 4/Maintaining hCG weight loss if you are in the menopause age bracket. Wheat Belly – William Davis – the truth about wheat and gluten in our day and age. I removed it over 4 years ago and haven’t looked back.